It used to be that if you wanted a WWII-era US SMG in the airsoft industry, you had to settle for a Thompson or one of the very expensive gas powered M3s on the market. In the last few years, a few AEG options hit the market, including models by Ares, ICS, and now S&T. All of the various models have their pros and cons, and I'll discuss them later on in this review. I feel that this model is the best one currently on the market, and to see why, keep reading this review! I obtained this gun to review through Evike, who has it available HERE, priced at $175 at the time of writing. This qualifies it for Evike's free shipping promotion which uses UPS Ground. They also have spare hi-cap magazines available for $18 currently. Many thanks to Evike for their continued support of our review program! The S&T M3A1 is an accurate replica of the later model M3A1, as opposed to the early M3 replicated by ICS. It is very similar to the Ares version, given S&T and Ares' working relationship, so you will see several similarities between the two in this review. The gun makes the term “full metal” feel like a gross understatement, as it is comprised almost entirely out of welded steel and aluminum alloys. It features a metal gearbox with a special split design to allow installation in the solid steel body. The fact that you're getting an AEG with a metal gearbox, welded steel body, battery and charger, and the whole thing costs less than $200 is pretty astounding. S&T packaged the M3A1 in a cardboard box emblazoned with images and information about the gun held within. Once I opened it up, I could see that the gun was held securely in a high density, soft foam inner liner to keep it safe during shipping. Once I pulled the gun out of the box, I was surprised with how big and hefty it was, as the gun doesn't look like it's that big in pictures. Along with the SMG itself, S&T includes a single 500 round hi-cap magazine, 8.4v 900 mAh NiMH custom small battery pack, trickle charger, cleaning/unjamming rod, basic manual, and a really cheap sling. Don't use the sling. When I say that this gun is full metal, I really mean that it is entirely structurally made of metal. Literally, the only plastic part on the gun is a small plastic liner inside the magwell to prevent the mag from wobbling. Everything else is made out of steel or an aluminum alloy, and the weight and sturdiness of the gun reflects that. Most of the gun is finished in a satin OD finish, which closely replicates the finish of the real gun. The paint seems pretty sturdy, however, I think it'll wear and age very well with use. Like the real M3A1, the S&T features a metal wire stock which can be retracted or removed entirely. When retracted, it is up against the body of the gun and can be uncomfortable against your wrist. When extended, it's not terribly comfortable, given that it's just a bent piece of steel wire, but it's certainly comfortable enough to use on the field. You unlock it using the large button located on the right side of the receiver at the rear. Once unlocked, you can set it in the retracted, extended, or removed positions by pulling it out. The stock has the correct features of the real gun, including the magazine loading tool, barrel cleaning rod (not for use in the AEG barrel) and ability to use it as a barrel wrench. The M3A1 uses a large stamped steel body which is formed in several pieces and welded together. The stock slides through four loops on the body of the gun which gives if very little free play in either position. As the body of the gun is pretty much one solid piece, there is absolutely zero wobble. 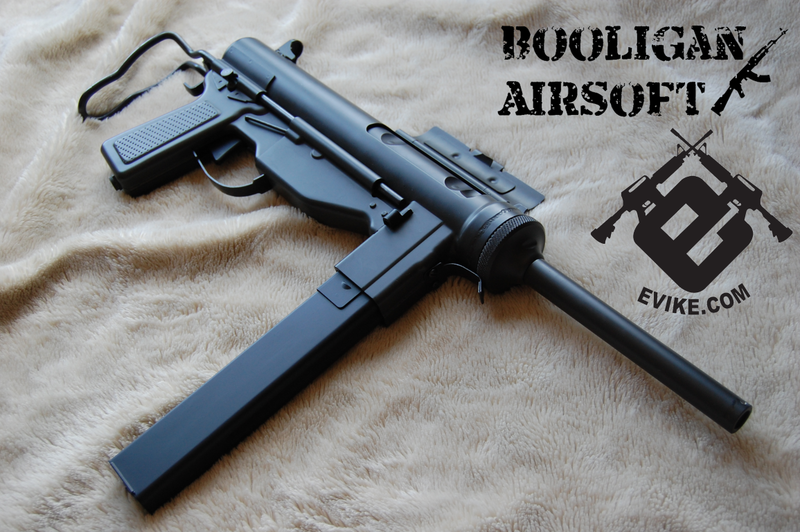 The controls are extremely simple consisting only of the trigger, which has some side to side free play, the stock release button, and the safety, which is actually the bolt cover. There is no selector switch, no safety button, or anything else like that. The pistol grip is rectangular in design and has weld lines around the front and rear, just like the entire gun. It's slightly longer than the grip on the Ares, which is more comfortable for me and my big hands, but less realistic. This extra length is crucial as the pistol grip serves as the battery compartment, solving the biggest complaint with the Ares, which had the battery held in the magazine. The bottom of the grip comes off by sliding the small locking piece to the rear and removing it from the grip. Don't lose this piece! The battery compartment is small, but fits the included battery, as well as some LiPo packs very well. I found that the Tenergy 7.4v 1000 mAh 20c split cell LiPo fits quite well and gives a nice ROF boost. The upper body of the gun is tubular and simple in design, housing the sling mounts on the left side and the bolt assembly on the right. The sling mounts are welded on so they should be solid enough to take some abuse. The bolt assembly fits into the body of the gun and is accessible through a large rectangular cutout in the side of the receiver. A hinged cover can be swung down and clicked into place to act as the safety for this replica. When clicked down in the closed position, the trigger system will not operate. The bolt itself can be pulled back manually, just like on the real gun in order to access the hop-up adjuster. The magwell is located in front of the removable lower portion of the receiver. That lower portion is made of an aluminum alloy and serves as a cover for the lower gearbox portion. You must remove it in order to access the internals and it is held in place by the metal trigger guard. The magwell is tight, due to the plastic inner liner, so you should break it in by installing and removing the magazine a few times. The magazine release button is located on the left side and is quite stiff, also requiring some breaking in before it gets easy to use. At the front of the gun, you'll find the easily removable outer barrel assembly with is screwed into the gun using a large knurled base. The base is held secure by a flat spring retainer. To unscrew the barrel, you hold this spring down and rotate the whole front assembly to the left, or counterclockwise if you were looking at it from the front. It must be removed in order to pull the entire upper gearbox out of the front of the body. Aiming the M3A1 is accomplished using the extremely basic fixed iron sights. The rear sight is welded onto the body of the gun, and the front sight is formed by the two halves of the receiver which are welded together. They are low, hard to see in low light, not adjustable, and partially blocked by the bolt cover hinge, but they are accurate to the original firearm, and I would ask them to be any other way. There are no trademarks whatsoever on the M3A1, unlike the Ares which has partially correct markings on the magwell. This magwell is blank, ready for custom engraving. The included magazine is a steel hi-cap which holds about 500 rounds. It is compatible with the Ares midcaps, however, it doesn't have to use their silly battery-in-mag system. It is NOT compatible with the ICS magazines. It fits very solidly in the gun, requiring a bit of a whack at the bottom to lock it in, and changing mags in the heat of battle does take some practice, due to the placement of the magazine release button. The front of my magazine got some scratches from the screws that secure the barrel lock spring, so I slightly unscrewed it without any complications. Given that the real gun shoots 450 RPM, any battery you use will give you a higher than realistic rate of fire, so if absolute realism is your goal, stick to a lower output 7.4v LiPo or the stock 8.4v. Range and accuracy were actually surprisingly good, considering the M3A1's short inner barrel. I was very comfortable putting shots onto my torso sized target out to 135' for first shot accuracy, and out to 150' if I'm walking my shots onto it with full auto fire. The iron sights are obviously extremely rudimentary, so I was largely aiming down the barrel and point shooting. Once you get the gearbox out, the first thing you'll notice is that it is unlike any other gearbox on the market. It uses a split design with the lower holding the gears and trigger microswitch and the upper holding the piston assembly and the motor. Like I said, a very strange configuration. In the upper gearbox, you'll find the ported brass cylinder, polymer cylinder head that resembles a Type 7 unit, nylon piston which gives a very good air-seal in the cylinder, mixed metal/polymer spring guide with is removable like a QD unit, and the long type motor. Everything was well lubricated, without an excess amount of grease bogging things up. The lower gearbox holds the steel gears, 8mm steel bushings, and the microswitch trigger system. There is a metal transfer bar for the safety system that prevents the microswitch from being tripped. The gears were also lightly lubricated and well shimmed and they spun very well without binding up. The M3A1 is fitted with a metal one piece hop-up unit attached to a 200mm long inner barrel. The hop-up is a specially designed unit which uses an extended slider arm that mounts to the side of the upper gearbox. The gearbox is supposed to be locked into the upper gearbox with a grub screw, but no screw was installed in the threaded hole. It uses a standard bucking and nub, and the barrel has a standard cut, so upgrades are easily accomplished. The ONLY modifications you can and should be doing to this thing are to upgrade the internals to make the gun shoot exactly to your liking. The only external upgrades this thing needs are time and wear. The steel body will age very nicely after extensive use in the elements. Alternatively, a very cool mod would be to build an integrated can on the front just like the special models fielded by the OSS. I've always been a fan of the M3 SMG design, and the M3A1 model in particular is my favorite, as it doesn't have the clunky cocking handle on the side. S&T did a fantastic job replicating it, with the stamped and welded steel construction, split full metal gearbox, and OD paint finish. The gun is MUCH more realistic looking than the ICS, and has a better battery system than the Ares, which is the best looking of the bunch. When comparing the S&T to the Ares, you're getting 99% of the same features, albeit without trademarks, but with the better battery solution, at about half the price. This is my basis for placing the S&T at the top of the M3 AEG hierarchy, and I feel very confident doing that. This thing is a very well built AEG, with good out of the box performance, and for a budget price. What's not to love? If you are not a mechanic you will never understand the importance of a grease gun. A grease gun make your greasing work easy. grease gun review will give you a vast idea about choosing grease gun.